The Unmanned Free-Swimming Submersible (UFSS) was one of the first autonomous underwater vehicles (AUVs). It was developed as a test vehicle in the late 1970s to demonstrate the potential of autonomous vehicles over long distances and to study laminar flow. The Naval Research Laboratory (NRL) initiated the UFSS study to develop an alternative means of accomplishing underwater tasks. NRL believed an autonomous vehicle could be designed to perform some of the work that then required tethered platforms or manned submersibles. UFSS was an early step in a larger systems study by the Advanced Ocean Vehicles Branch of NRL’s Marine Technology Division to develop a vehicle that could travel 1,000 miles autonomously. Built by Rockwell International, UFSS was given a low-drag hull and designed be laminar over 90% of its body surface. Laminar flow is a type of fluid flow in which the fluid travels smoothly or in regular paths so that velocity, pressure, and other flow properties at each point in the fluid remain constant. UFSS’s hydrodynamic design allowed it to achieve a cruise speed of 5–6 knots using only a half-horse power motor. UFSS’s subsystems were developed independently and then integrated into the vehicle as a whole. These subsystems included standard lead acid batteries as an energy source, a microprocessor-based guidance and control system, an oil-filled variable frequency/variable voltage AC motor for propulsion, and a micro-processor-based navigation system that utilized dead reckoning combined with periodic updates from the OMEGA navigation system. A failsafe system was also built into the vehicle to monitor it and initiate corrective action in case of trouble or malfunction. The outer structure of UFSS was composed of two main sections: a forward orange dome made of fiberglass and a white afterbody of aluminum. The afterbody consisted of two segments, a tail cone milled out to create a 1/8-inch-thick skin and four fins made of aluminum-stiffened syntactic foam. UFSS was a free-flooding vehicle excepting a pressure vessel that remained at atmospheric pressure and contained the vehicle’s energy pack; control, navigation, and telemetry computers; and trim and variable ballast systems. Development of UFSS began in July 1975 and lasted four years. Initial sea trials were conducted in the summer of 1979 in the Patuxent River at Solomons, MD, over a three-month period. 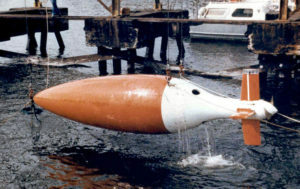 The shallow-water tests demonstrated that UFSS could maneuver autonomously using its microcomputer, but also revealed potential handling problems with the hull. The slightest dent or dimple in the bow significantly reduced the UFSS’s low-drag characteristics. The UFSS program ended in the early 1980s. The AUV was stored at NRL until 1990, when its manufacturer Rockwell requested its use for additional testing. After three years at Rockwell, UFSS was no longer needed. The Navy elected to transfer it to the Naval Undersea Museum in 2003.